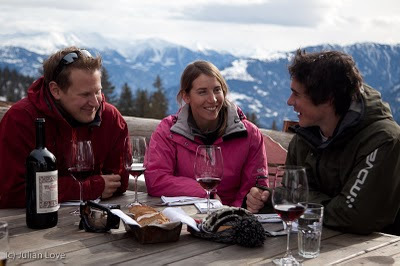 On my recent shoot in Switzerland I used 2 of the relatively new Elinchrom Ranger Quadra battery powered flash units. As there is not that much information around on them I thought I would share my impressions here. First of all, a bit of background. All my shoots are done on location, and I usually work with just one assistant. Taken together these two facts means my kit has to be lightweight and as portable as possible. Traditional battery pack flashes are large and heavy - a single Profoto 7b or Elinchrom Ranger (big brother to the Quadra) setup will weigh in at 12-15kg. In comparison, the Quadra is only 5kg all up - pack, cable and head. Because of the light weight, it is also possible to use a light weight stands, which save you another kilo or so. So what are the Quadras like to use? Firstly, they are small, and the heads are in fact tiny. 2 packs, 2 heads and 2 spare batteries will easily fit in a Lowepro Photo Trekker backpack with room to spare for a camera body and a couple of lenses. 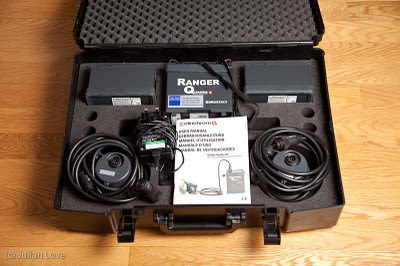 Build quality of the packs is quite good, if not as bullet proof as a Ranger or Profoto 7b. The heads are rather flimsy however, with the reflectors built of quite thin metal that bends easily. So just how powerful are they? 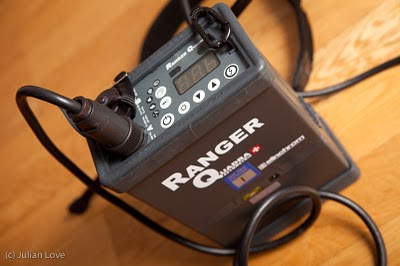 The Elinchrom Ranger Quadra is rated at 400ws. That's about a stop and a half less than its 1100ws big brother, the full size Ranger, and the 1200ws Profoto 7b or Profoto B2. How much more powerful is it than a speedlite? Well, one of the problems in comparing battery flashes with hotshoe flashes is their power is rated differently. Battery flashes are measured in watt seconds, while hotshoe flashes use a guide number. The easiest way to know for sure is to test them, which is what I did. So the Quadra is about 1.3 stops more powerful than a 580 EXII, and about 2 stops more powerful, and with much more even coverage, than an SB28. But in all cases the Quadra recycles much faster - a speedlight on full power takes over 5 seconds to recharge, where the Quadra takes just 2. One of the big advantages of battery flashes over speedlites is the range of light modifiers available. The Quadra heads have a built-in mount for a shoot through umbrella, and Elinchrom also make a 40cm soft box for them. Using a relatively lightweight adapter you can also attach any of Elinchrom's other modifiers for their larger heads, including the highly rated octaboxes. I only had the chance to use them with shoot through umbrellas, but the mounting system is quick and easy, you just slide them in. Be advised all Elinchrom brackets use the non-standard 7mm shaft, so you need brollies especially designed for Elinchrom. OK, fine. But how do they perform in the real world? Unlike a speedlite, the Quadras do have enough power to work as key or fill light on a reasonably sunny day, even when shot though an umbrella. Here's an example shot in cloudy bright light. With the pack on half power (200ws) the flash head was being held on a boom and being shot through an umbrella about 2m above and in front of the subjects. Recycle time is less than 1 sec. To do this with a speedlight would have required full power and about 5 seconds recharge between shots - way too slow for me. And if the sunlight had been any stronger I would not have been able to balance it unless I shot without an umbrella, giving harsh, unnatural looking light. Shooting lifestyle images like these requires a lot of shots. Once you set up the initial parameters, the models have to interact with one another while you shoot away to try can catch a natural moment. With a fresh battery the recycle time starts off at around 1 second, but it rapidly increases as the battery loses charge. In fact after about 80 shots the recharge was so slow (4 secs plus) that we needed to change batteries. So plan on carrying spares for a day of shooting. Another thing to mention is the Quadras have Elinchrom's wireless Skyport system built in, so you can adjust the power of the flash from on camera, using a small device that sits in the hotshoe. It is much smaller than a Pocket Wizard Plus II (which is what I normally use), and allows wireless power adjustment of multiple groups, not just triggering, which is pretty neat. When working with an assistant it's not quite as important, but when working alone this would be a really handy feature. So it's a bit of a mix up which is better - it depends on what you are looking for. Overall though I was very happy with the Elinchrom Ranger Quadras. What I would like to see is a longer lasting battery - Lithium Ion anyone? (or maybe not - see the comments from Dan Carr below), more sturdy reflector and a cover for the flash tube when travelling (looks like they've fixed this now). Otherwise I think Elinchrom are on to a winner. It make me dream to travel like this for shooting. Julian , thanks for taking the time to do this. Very interesting! One thing though, you mention Li-Ion batteries.... well the problem there is that new airline regulations limit the size of Li_ION batteries that you can take on a plane, even in your checked luggage. , that Erik Seo posted has some good info and explains the amount of Li-Ion that you are allowed in your checked bag. Up to 25grams I believe. If for example you shoot with a Hensel Porty power pack , you are in trouble! Any security person that reads the small print (and that seems to be most of them these days) will stop you taking it on the plane. I'm guessing the quadra is still a sealed lead acid battery like the ranger RX. Hi Dan - thanks for the info on Li-Ion batteries....that's quite a significant drawback. I've been quietly admiring the new Hensels as they are so light and recharge so quickly for such a powerful pack. But if I can't fly with them they're pretty useless! Great read, thanks. I am up in the air as which way to go and this article was a great help. Hi any idea what the flash duration is on these units. I find when I use this type of unit the flash duration is quite long and thus does not give me a sharp enough image on a moving subject. Would love to know if these units are quick. Lumedyne were the quickest but not much more than my speedlights and the high speed sync on the speedlights with the pocket wizard tt1 and tt5 always give them the advantage. Agreed on power though, although Quantum batteries do help the recycle and help keep the weight to a minimum. Thanks Alot for the info, I have decided to get a set. I used the Ranger RX Speed AS with A and S head, but it is just too darn heavy. Great Review! Great post. I really appreciate the flash output comparison too. I'm looking at getting a Ranger setup soon but in the meantime I'm using 2 SB800 speedlights through an Elinchrom octa with a bracket I made. I'm just about to do a post on how I did it. Great article...any updates on how you're finding the AcuteB??! I'm thinking of investing in them or the quadra hybrid. It's the Quadra setup able to work with hss? I'm think of getting the kit for next year's wedding season. Thank you.